SpringCard K663 is a versatile contactless/RFID/NFC coupler. This document explains how to upgrade K663’s firmware, using the new SpringCard Firmware Upgrade Utility. And also the smart reader counterparts of the above couplers (K663/RDR, Prox’N’Drive/RDR, etc). 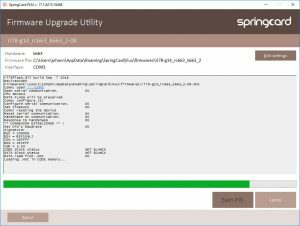 The SpringCard Firmware Utility works on Windows 7/8/10, on both x86 and x64 releases. You’ll need a serial port on your computer, or a working USB-to-serial interface, in order to flash your device. Some device also require a specific interface or level translator to be able to perform the firmware upgrade procedure. Please refer to the product’s specific documentation for details. Launch the downloaded setup executable. 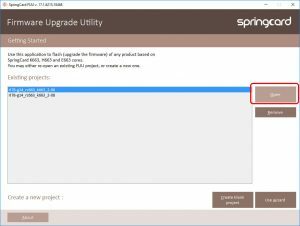 FUU’s project Wizard automatically fetches the latest version of firmware for the device. 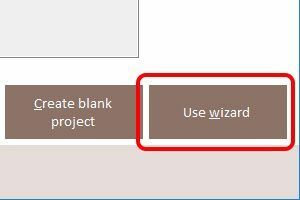 Your computer must be directly connected to the Internet to use the project Wizard. If you are behind a proxy, the proxy settings must be configured system-wide (Windows’ Control Panel -> Network and Internet -> Proxy). If this is not the case, please skip this part down to “Using FFU with a custom project”. For all the couplers based on the K663, select Serial Couplers -> K663 family. For all the smart readers based on the K663/RDR, select RFID Scanners and Readers -> Misc. serial Readers . 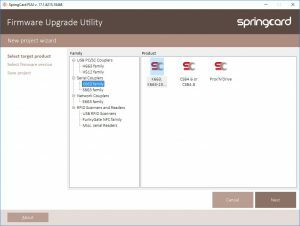 FUU connects to server files.springcard.com and retrieve the list of firmware versions that are suitable for the selected product. The latest version is selected by default (but you may choose an older version should you require it). 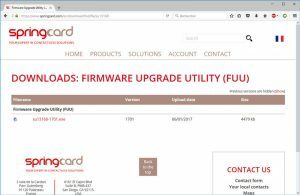 FUU also offers to choose the directory where the firmware will be download to. We recommend selecting “your private FUU folder”. FUU now downloads the chosen firmware to the selected directory (this takes only a few seconds). The name of the project appears in “Save project as”, and is deduced from the firmware file name. You may change this if you want. 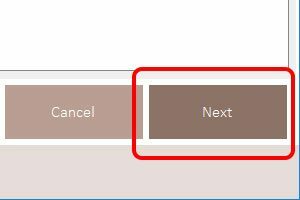 The box “Please select the flash method” shall remain to “rl78flash”. In the box “Communication interface”, please select the communication port your device is connected on. You will be able to change this afterwards if your device is not connected yet. You may now skip the next part and go down to “Flashing your device”. In the “New project” screen, under “Hardware family”, click K663. 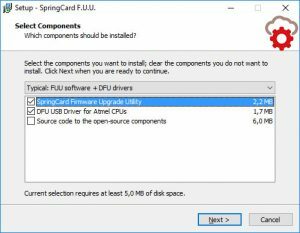 At this step, FUU opens a dialog to select the firmware file you intend to flash (extension is .mot). The same dialog remains available afterwards by clicking the “Browse” button. 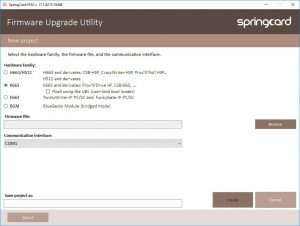 Which firmware file shall I use for my device? 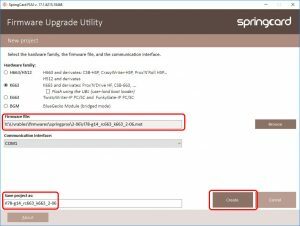 If you are following this “manual” procedure, it is likely that you already have a custom firmware provided to you by SpringCard. The subdirectories are named after the version (for instance http://files.springcard.com/firmwares/springprox/1-74 stores all the firmware files in the 1.74 branch). 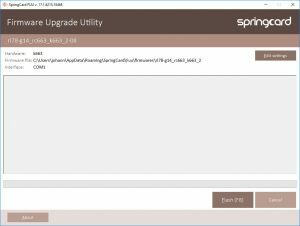 The subdirectories are named after the version (for instance http://files.springcard.com/firmwares/iwm2_scan/1-50 stores all the firmware files in the 1.50 branch). 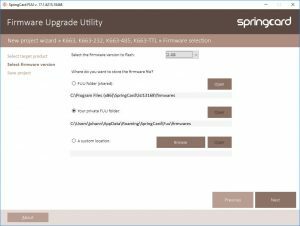 Download the firmware you need and save it on your hard drive. Then tell FUU the .mot file you wish to use. 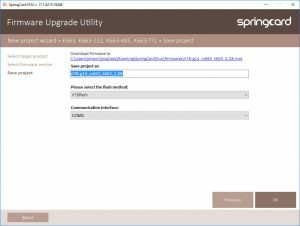 Once the firmware file has been selected, the name of the project appears in “Save project as”, and is deduced from the firmware file name. You may change this if you want. The box “Flash using the UBL (user-land boot loader)” shall unchecked (until further notice). 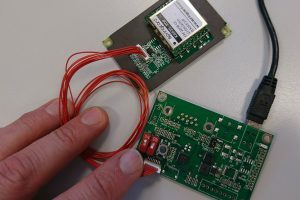 Once your project have been created using either method, you are ready to flash the firmware in the device immediately. 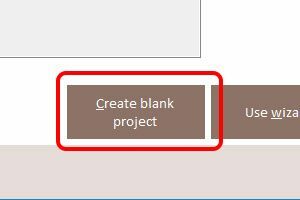 Afterwards, just select the project in FUU’s main screen and click “Open” to use the same project again. (Projects that will not be used anymore may be cleaned-up using the “Remove” button). 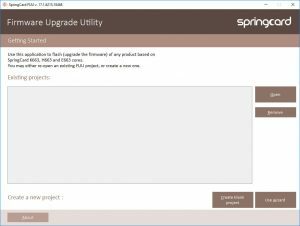 The software is now ready to flash your device – but we still have to prepare the hardware! The computer and the the module communicates through the RX/TX pins. FLASH switch set to the OFF position: the device is ready for operation. 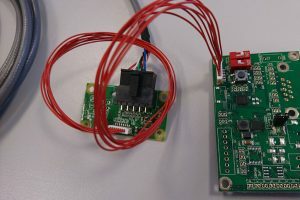 The TwistyWriter and the CSB feature a FLASH switch on their PCB. Move the FLASH switch to the ON position for flashing. Don’t forget to move the switch back to the OFF position afterwards. NB: to open the CSB shell, unscrew 4 screws at the bottom. Pay attention that the screws at the back are a little longer than ones at the front. Placing the longest screws at the front will damage the top cover. The K663-TTL and K663-232 don’t feature the FLASH switch. 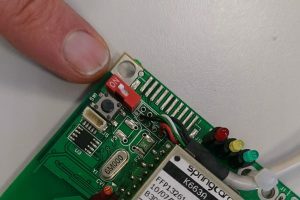 They must flashed through one of SpringCard’s interface (see https://www.springcard.com/en/products/usb-interfaces for the USB interfaces and https://www.springcard.com/en/products/serial-interfaces for the Serial interfaces) connected to the device’s 8-pin JST connector. Remember that the interfaces having a DB9 must be powered using the supplied mains adaptor (9V DC). Set the interface’s FLASH switch to the ON position for flashing. A JST 8 to automotive connector (part# TBD). Your own PCB must integrate the logic required to flash the K663. 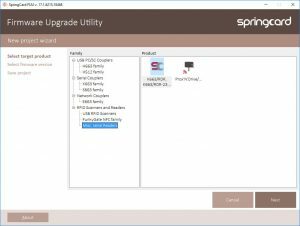 Please contact SpringCard Support to validate your schematics before manufacturing, to make sure you’ll be able to perform on-the-field firmware upgrade of the module through your product. 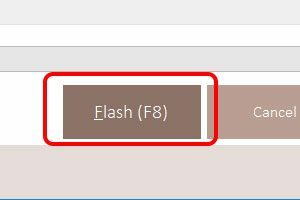 Now that both the software and the hardware are ready, just click “Flash” (or press the F8 key) to have FUU flash your device! Once terminated, the “Flash” button becomes available again, and “OK” is displayed. 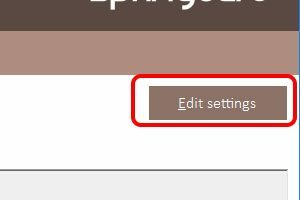 Use the “Edit settings” button anytime you need to change the communication port. Transistor-Transistor Logic. All standardized common TTL circuits operate with a 5 volt power supply. A TTL signal is defined as "low" or L when between 0V and 0.8V with respect to the ground terminal, and "high" or H when between 2V and 5V. RS-232 is a standard for serial binary data interconnection between a DTE (Data terminal equipment) and a DCE (Data communication equipment). It is commonly used in computer serial ports. The RS-232 standard defines the voltage ±12 V levels that correspond to logical one and logical zero levels.